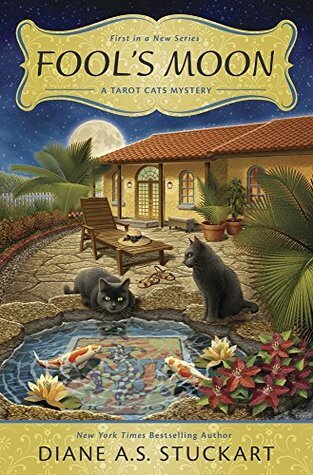 Fool’s Moon by Diane A.S. Stuckart is the first book in the new cozy Tarot Cats Mystery series. As one might guess the series has a touch of paranormal with the use of tarot but this one is also completely out of the ordinary with the pets in the story getting the job as the narrators. Ophelia and Brandon are two siblings kitties that have just lost their beloved owner when the owner’s son tapes them into a box and dumps them. Brandon manages to escape the box but Ophelia gets stuck and luckily human Ruby Sparks comes to Ophelia’s rescue. Ruby has been working giving tarot readings in her sister’s new age shop when a woman named Luciana comes in for a read. Luciana recognizes Ophelia right away as she used to be the housekeeper for her former owner. What Luciana asks to have the cards answer for her however is quite a surprise, she wants to know if her former boss was murdered. Ok, so as a lover of over the top quirky cozy reads I couldn’t have found another that was quite as unique as some crazy critters playing detective. From the two kitties, a loving pit bull and even a koi that gives out prophesies you can’t get more unique than coming from their point of view. While I did enjoy this opener of the series I do think it had some slower moments for a mystery, maybe coming from the more simple pet POV but it’s certainly an interesting start leaving me to rate this one at 3.5 stars. 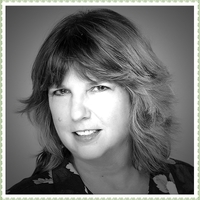 DIANE A.S. STUCKART is the New York Times bestselling author of the Black Cat Bookshop Mystery series. She’s also the author of the award-winning Leonardo da Vinci historical mysteries, as well as several historical romances and numerous short stories. Her Tarot connection is even more sprawling. She’s been an on-and-off student of Tarot since she was a teenager, though she confesses to being more of a collector of decks than a reader. She will, however pull out the cards for a friend on occasion. Diane has served as Chapter President of the Mystery Writers of America Florida chapter, is a member of the Cat Writers’ Association, and also belongs to the Palm Beach County Beekeepers Association. She lives west of West Palm Beach with her husband, dogs, cats―including the real-life Brandon Bobtail and Ophelia―and a few beehives. I shall have to see. I love stories where the animals are involved and a little narration is okay, but not a big fan where the animals are leading the story and narration. Nice review Carrie. It definitely sounds quirky. Thanks Carla! I wasn’t expecting them to be leading the story, I seem to keep stumbling into these. LOL But it wasn’t too bad a start. I will give it a try and if it doesn’t work for me, I will move on.